is today. He’s turning One! I’ve been staying with him and his grandparents (friends from junior high) on and off since the beginning of the year under somewhat trying circumstances. They have been so kind and generous. I just had to do something to say Thank You. This seemed like the right occasion. 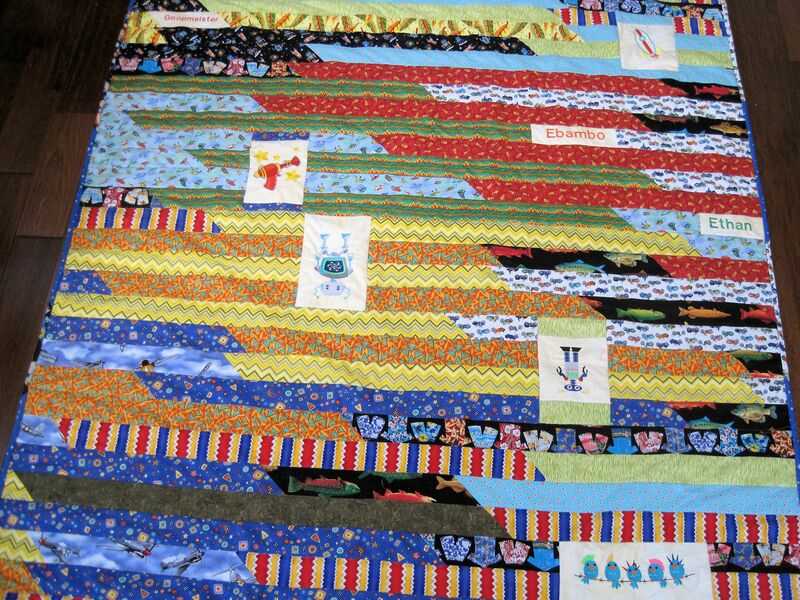 The quilt is a mix of embroidered designs and strip piecing. I dug through the stash pulling out all my “little boy” prints, and surprisingly there were quite a few. The embroidery designs are ones I’ve had for ages, and always wanted to try. Just haven’t had much need for robots and ray guns. 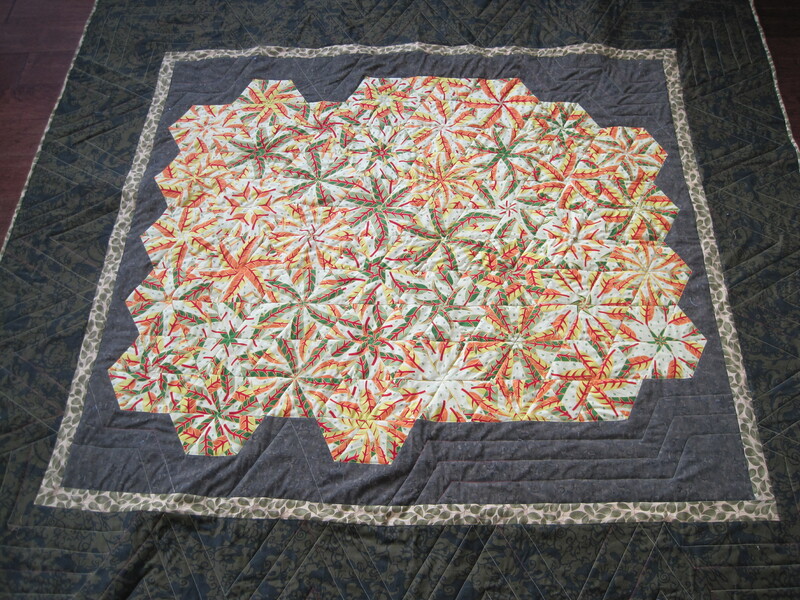 The piecing on the quilt was very simple. Just joining 3 inch strips end to end to end. Fold in half longways (that’s a word, isn’t it?) and stitch. Fold in half again. And Again. And Again. It reminds me of making butter pastry with all the folding. My biggest fear was that one of the folds would require cutting a robot in half. The back of the quilt is pretty generic. Nothing fancy. The binding was made using the remaining bits of primary fabric. 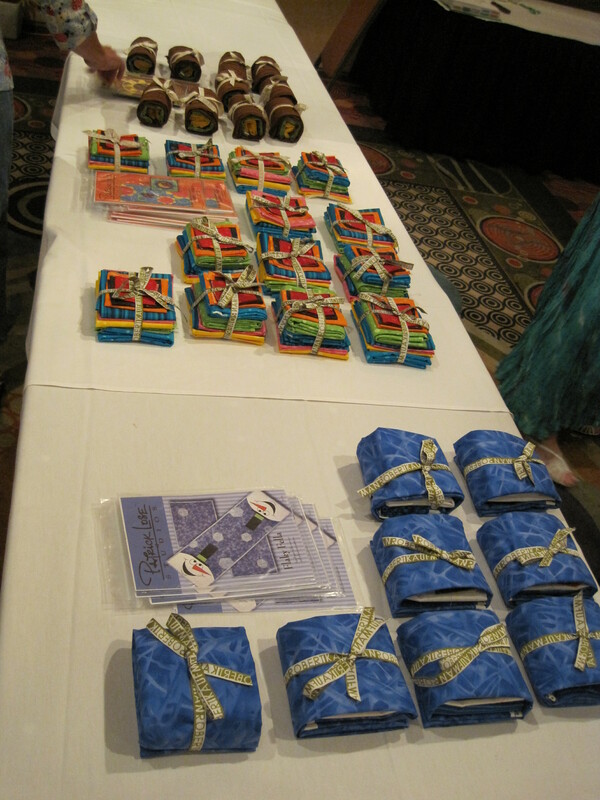 The fabric is a mix of all sorts of prints. Motorcycles. Hawaiian shirts and shorts. Planets. Robots (yes, more robots). Frogs. Geometrics. Dragon teeth. I suppose I could have made it using more of a themed motif, but this is bright and lively, and I think suitable for a wee lad. It gets the Phred Nap of Approval too! I have said many times that I am not a quilter. And I’m not. My brain doesn’t tend to go in that direction. That said, sometimes one just needs something a bit mindless but creative to do. This was such a project. 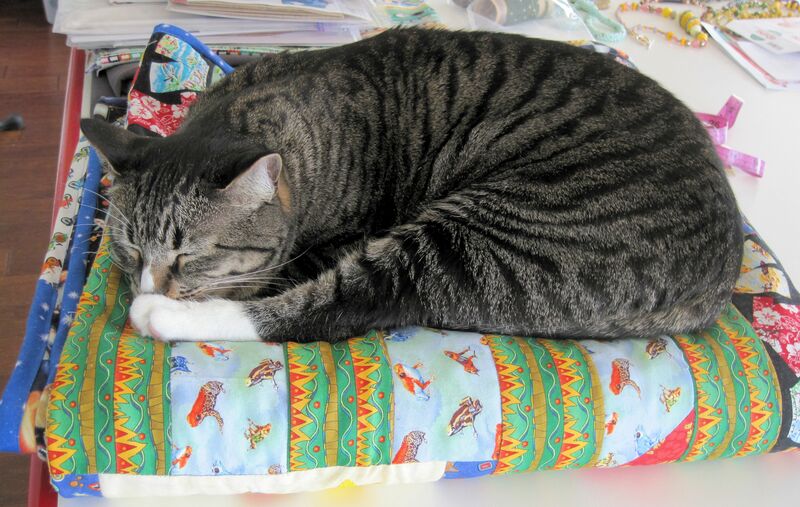 I had originally planned to put this quilt on the “gift” pile, then Prince Charming said he really, really liked the green border fabric. The fact that he said so on several occasions gave me the clue that perhaps it should stay with us. Now he has his own quilt. The catch? It must be shared with Max and Phred. The base design fabric was some bright yellow, orange, red and green spiky leaves. Once they were all cut and stitched to One Block Wonder specifications, they turned into starfish looking shapes. Ok, maybe starfish don’t have 6 arms, but you get the idea. 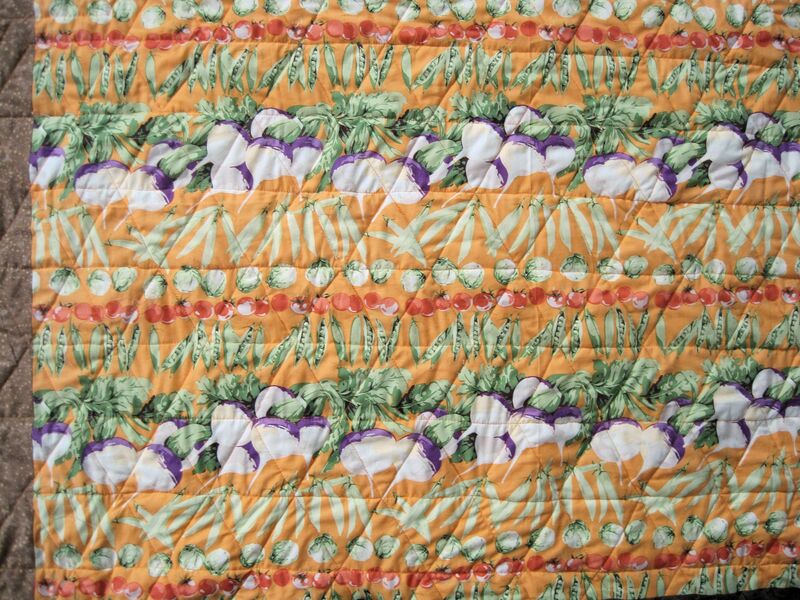 Since this quilt was now earmarked for Prince Charming, I went through the scrap bin looking for suitably masculine prints for the backing. 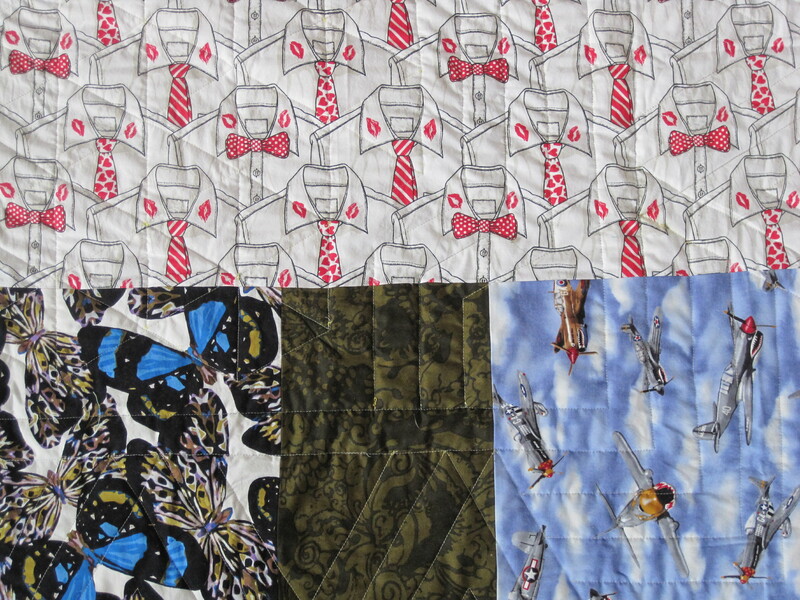 Smoochified neckties, World War II bombers and leftover border fabric were the result. I think I made a pair of boxers out of the necktie fabric many, many years back. 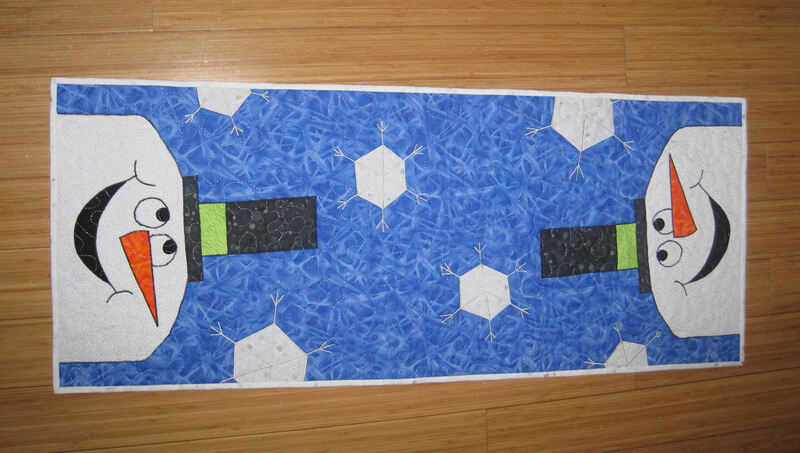 After quilting all the triangles of the kaleidoscope fabric I didn’t have much energy to do the borders. 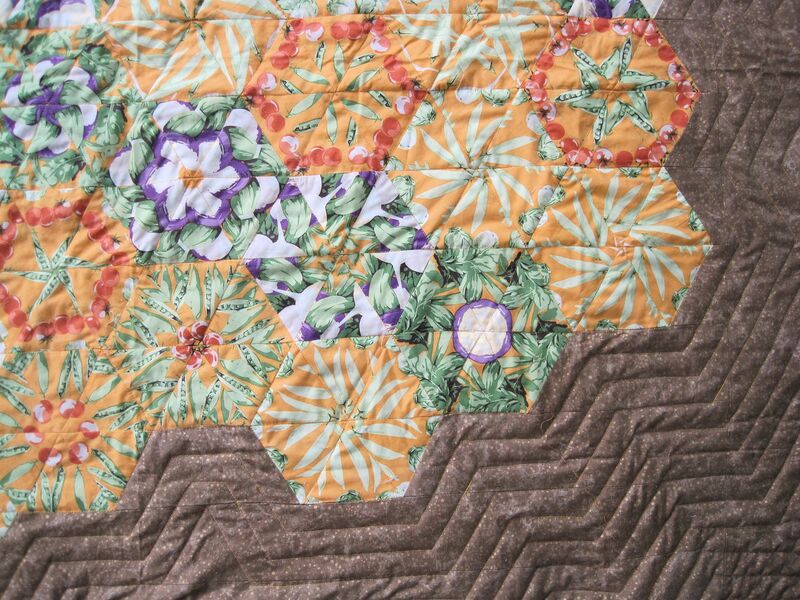 Those are a simple geometric triangle pattern, quilted just enough to hold everything together. 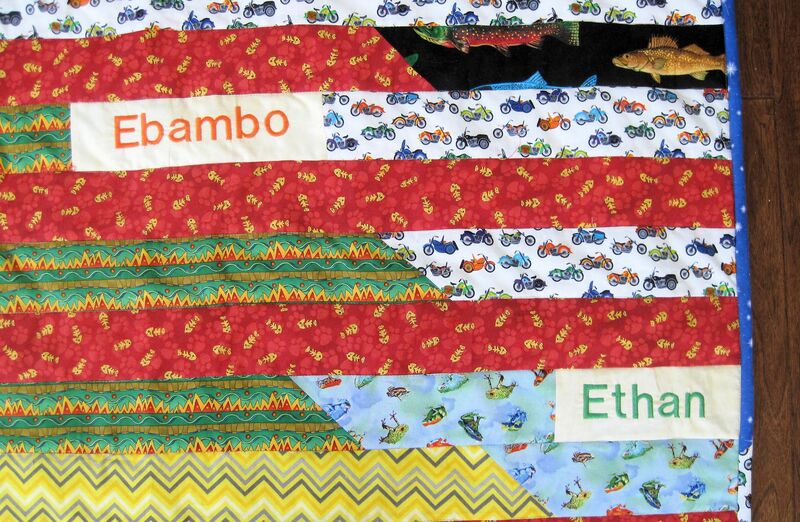 This quilt is just a bit smaller than twin blanket size – just large enough to snuggle up while reading. I will be the first to admit I am not a quilter. I make one quilt every 4 to 5 years, if that. Not my forte at all. I have this aversion to cutting up beautiful fabrics into little bits, then stitching them back together again. 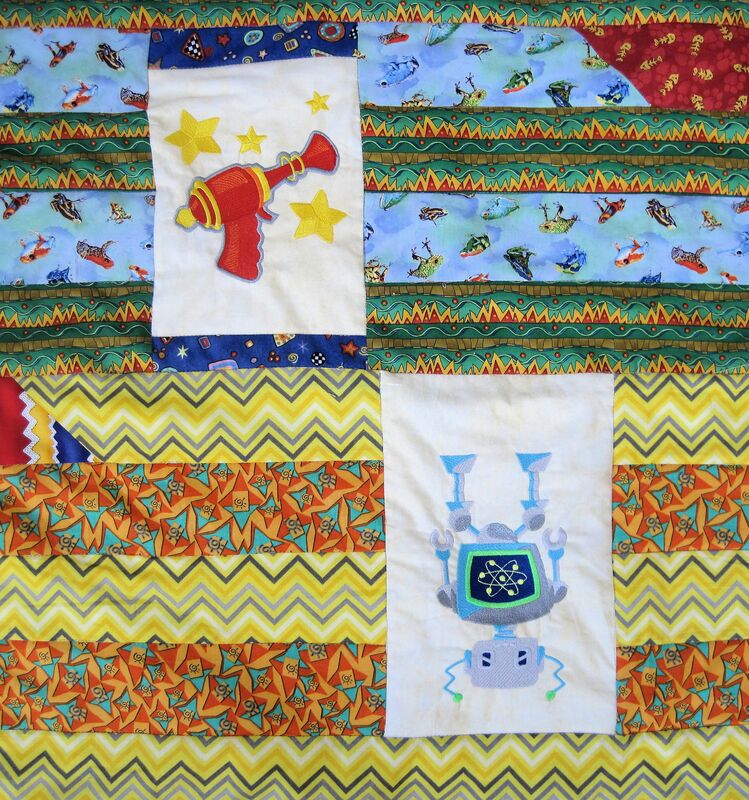 That said, I also think quilts are like fine wine. They need to age for a while. This quilt top aged in the stash for over 3 years. Maybe 4. Long enough that I don’t remember an exact date. I found myself with some unexpected free time this holiday season, so decided to finish it. After all, it just needed to be backed, quilted and bound. Easy peasy. Simple wimple. Even better, this one was for me! It was NOT intended as gift. The pattern is called One Block Wonder, which is pretty much the only quilt pattern I make any more. I like that it allows you to use the oddest prints – you know those funky graphics you like, but have no idea what to do with? Those! Once it’s cut up and reassembled, you get a lovely kalidescope effect. I always try to get extra fabric, so I can incorporate the original print on the back. As you can see this one started out life as rows of vegetables: turnips, radishes, peas. I really like the turnips! 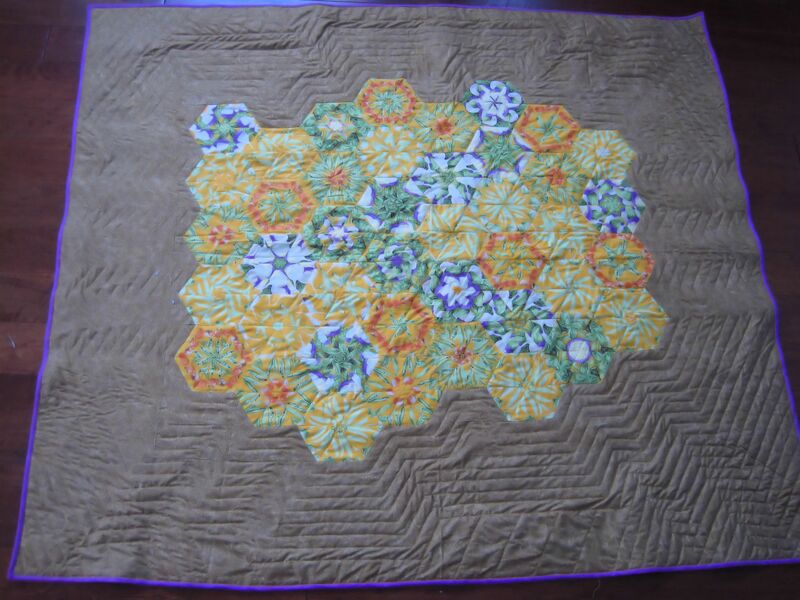 To quilt it, I chalked around the central motif with 1 inch bands, creating a halo effect, then quilted it. 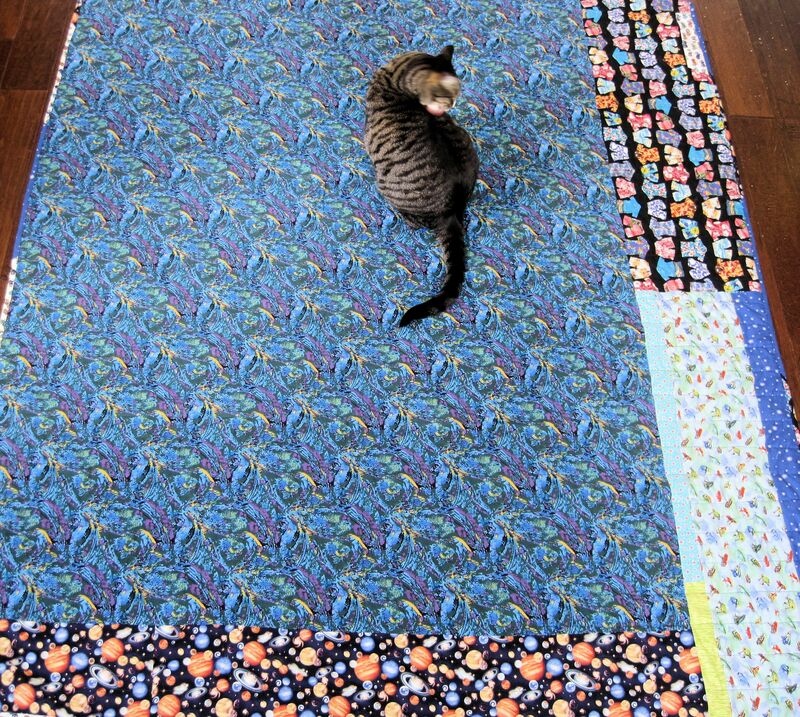 This allowed me to gradually work out from the center, so I was never trying to stuff the whole quilt into the sewing machine harp. Worked pretty well, if I do say so myself. Rain is expected today. The cats and I will have something warm and cozy to cuddle up with. Yum! Everyone had an opportunity to select from one of three projects to do. There was a table runner, Flaky Fella, a banner, Upwardly Mobile and a table topper, Suny Side Up. I picked Flaky, as table toppers and banners are not my cuppa. 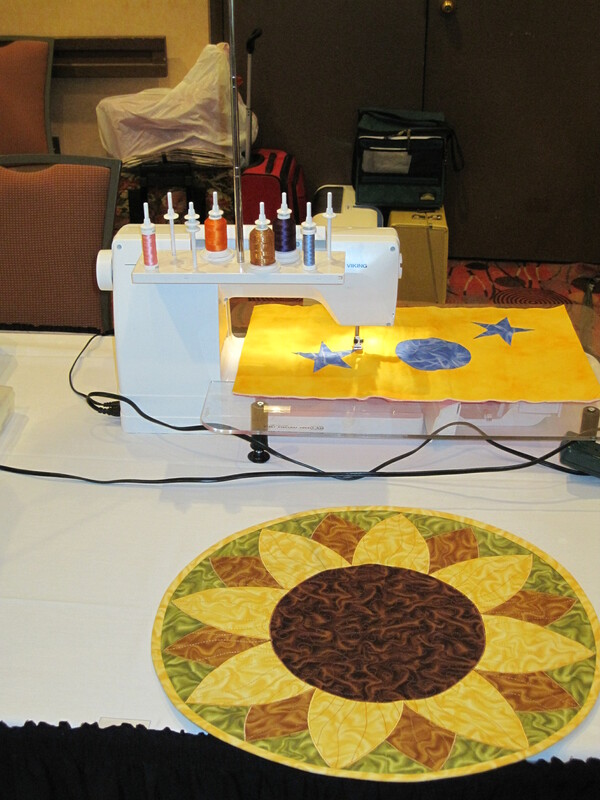 While I maintain that I am not really a quilter, the workshop was a blast! Patrick has a sly, dry sense of humor, while his business partner Gary did a bang-up job of coraling the verbal chaos…or adding to it. I forget which. Both gave as good as they got from the 35 fiesty females attending. All the projects were fusible applique, a technique I had never tried before. This made for an opportunity to learn something new! 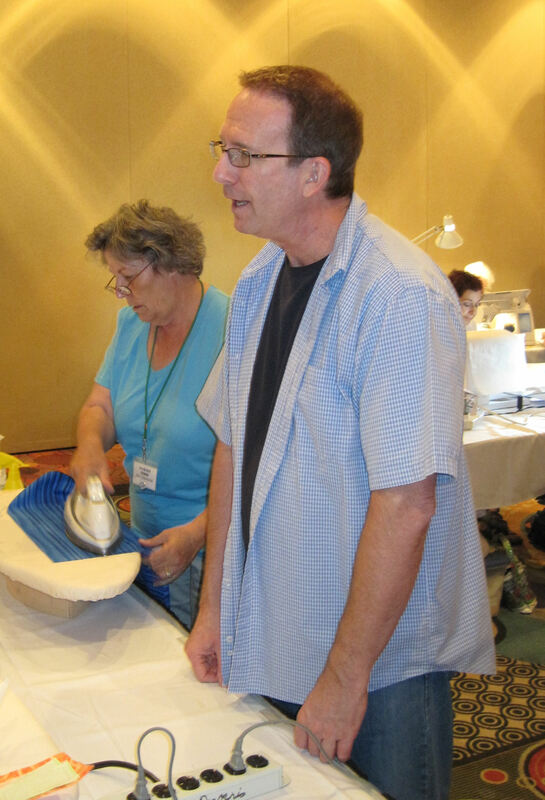 Patrick also did some demonstrations for the group. One was how to meet up the ends of your quilt binding so it looks continuous. I’d read about this process, and seen pictures in books, but it took seeing it in real life for the Eureka moment to happen! He also showed a method of mitering the corners of binding to lay flat. This tip alone was worth the class! Who’d have thought it was so easy, and so simple, and involved sewing right off the edge of the binding! Of course, with a group this large, not everyone pays precise attention to details…or as I informed Patrick, “I thought the words were only there for people who didn’t understand the pictures!” Yup! Guess who didn’t read the instructions? Moi! But you know, that turned out to be just fine, as all of our bobbles and blips become design features, making each project creatively unique! Not once were the words “could have” or “should have” uttered. The whole day was a delight. This is how Frosty turned out. I think he looks pretty happy with himself. This is how he should have turned out. What can I say, we have wide tables!